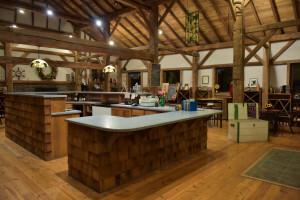 The tasting room is located in the hayloft of a nineteenth-century timber-frame barn built circa 1870 by George Mallow,owner Bill’s great-great-great grandfather. It is believed that much of the current barn may date back to an earlier barn, perhaps built in the 1830’s. A fire may have left the barn in disrepair, but many of the larger beams were recycled and used to build the “new” barn in the 1870’s. 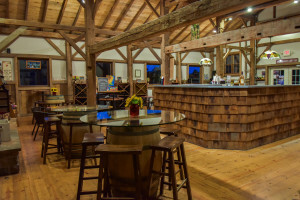 As you walk into the tasting room, you will be welcomed by these hand-hewn beams and feel a connection to those artisans of the past. We invite you to enjoy a complimentary wine tasting, offered every day, in our historic and rustic tasting room. Cozy up to the fireplace in the winter, or listen to the rustling of the leaves in a warm breeze while sipping wine on the deck in the summer sun.